Seeds or plays on table. 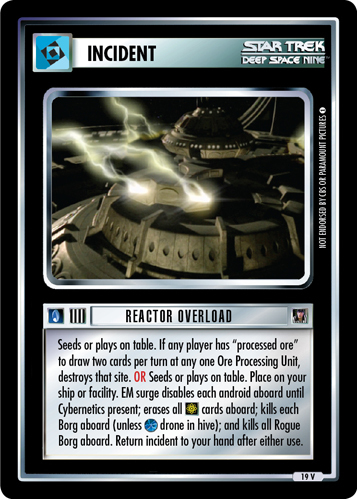 If any player has "processed ore" to draw two cards per turn at any one Ore Processing Unit, destroys that site. OR Seeds or plays on table. Place on your ship or facility. EM surge disables each android aboard until Cybernetics present; erases all cards aboard; kills each Borg aboard (unless drone in hive); and kills all Rogue Borg aboard. Return incident to your hand after either use.